Between 1,500 and 2,000 students protested in Galway today in the run up to next month’s budget. STUDENTS FROM NUI Galway, the Galway-Mayo Institute of Technology and Athlone IT gathered in Galway city centre this afternoon in protest before next month’s budget. Gardai estimated a turnout of between 1,500 and 2,000 students who were protesting against proposed fees of €3,000 in 2015 as well as further grant cuts. The protest was organised as part of the ‘Fed Up? 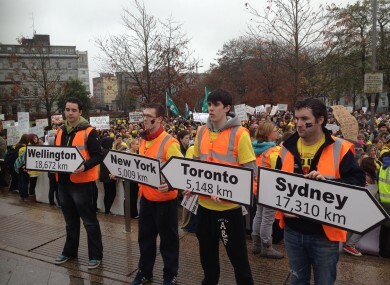 Stand Up’ campaign by the Union of Students in Ireland (USI). The protest came as tens of thousands of students continue to wait for their student grants to be processed. Led by the USI, the march started in Eyre Square before moving to the offices of Labour TD for Galway West Derek Nolan. Students should be allowed to lobby and it is healthy to protest. As a government TD, I can see the rationale for them marching to my office. I don’t see it as being hostile towards me. I have previously met students from both NUI Galway and the Galway-Mayo Institute of Technology and understand the pressure that they are under. USI and Students’ Union representatives are set to present their own set of arguments against fee increases and grant cuts to government tomorrow, as well as alternative ways in which third-level can be funded. USI President John Logue said their campaign was starting to build momentum. “Our public meetings on the cost of college are attracting hundreds of students, parents and concerned members of local communities,” he said. Email “Students in pre-budget protest against fee increases and grant cuts”. Feedback on “Students in pre-budget protest against fee increases and grant cuts”.